After a very relaxing Friday evening with live music, fireside chats and a wine tasting (from the wine farm of Lee Wallis, no less! ), Saturday kicked off with workshops bright and early. I was honoured to be asked to join my colleagues Cliff and Brian from Sydney HEMS in partnering with some incredible and inspiring PHARM friends from South Africa as they put together their workshop on critical care retrieval. 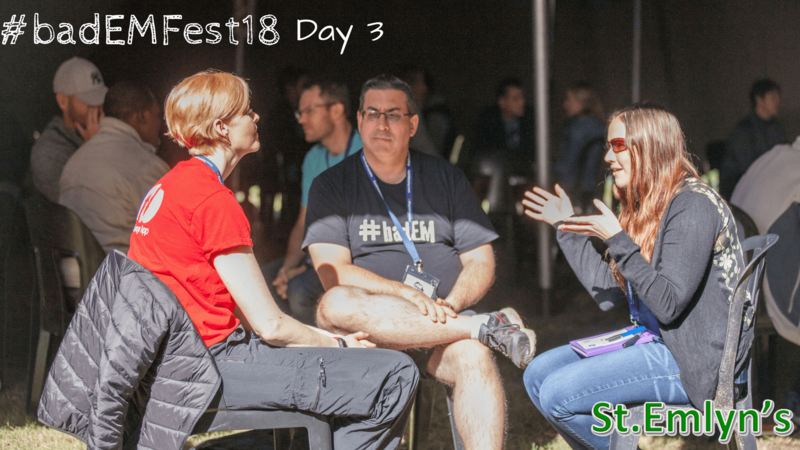 My understanding from Jo Park-Ross, Willem Stassen and Louis Jordaan was that critical care is often thought of distinctly from prehospital and retrieval medicine, and our aim was to explore that mindset and discuss the challenges. I really liked the pairing of doctors and paramedics; just like in my day job, I felt it was very much the local EMS faculty’s well-trodden turf and that we were there to provide some discussion from a different context in the hope of finding common solutions. We kicked off with a really challenging case, shared by Willem and facilitated by Cliff, which explored a wide range of non-technical skills challenges; something we know well at Sydney HEMS. We talked about how our own emotions can make tough situations even more difficult; how governance structures and graded assertiveness can provide frameworks for dealing with clinical practice challenges, and how crucial induction for new members of staff is in equipping them to deal with the unique difficulties we face in the prehospital and retrieval world. Kudos particularly to Willem for bravely sharing a real-life example of all of these factors in action and for his humility and openness to reflection – I certainly got a huge amount from the discussion so I’m sure the participants did too. For the second half we split for fireside chats about specific challenges in airway, breathing and circulation cases. I really enjoyed this part of the session, realising that the challenges we face – whether clinical or sociological – are very similar. The solutions aren’t always the same but finding common ground with colleagues around the world always gives me that feeling of… well, Ubuntu. Elsewhere, I heard great reports from the Wilderness Medicine workshop facilitated by Kirsten Kingma and Ross Hofmeyr, based on their own experiences as patients and involving simulation to draw out key learning points. This was a real exercise in some search and rescue, casualty care and then an extraction from the wilderness to definitive transport. Simon went on this one so he can fill you in…. Simon – Ross and Kirsten put on a really interesting and challenging ‘experience’! We ran this as an exercise intended to give us all a deeper understanding of how wilderness medicine works and how it is not quite as simple as walking around until you find someone and then wandering off to a hospital. Tasked to locate, treat and extract two seriously injured paragliders (note: both Ross and Kirsten have suffered major trauma whilst paragliding, so this was super personal) from a crash above the farm dam. There were so many learning points but I’d highlight the LAST aide memoire as something we will all take away. We also discussed how the environment influences pretty much everything we do; here in the UK that could be cold, but we also need to consider the effects of heat and sunburn. We discussed a range of analgesia options including Penthrox and talked about how much medication is needed, proportionate to the environment and the casualty. Basically, you need the goldilocks version of medical intervention; just enough to be safe but not too much to overcomplicate or hamper your rescue. Even on this simple rescue there were so many different aspects brought together by the instructors. If this sort of thing floats your boat, check out Ross’s website here. And although I couldn’t attend the ECG Campfire Coffee Huddle, I was lucky enough to see Sa’ad Lahri, Kamil Vallabh and Jacques Malan talk about ECG in Sweden at #SWEETS15 – I have no doubt it was educational, entertaining and appropriately caffeinated. If you ever get the chance to hear these three speak – take it! The pre-lunch session (somehow it felt like everything at BADEM was either just before or just after food – and the food was excellent!) opened with Vytautas Aukstakalnis talking about his project to introduce the “Black Box recorder” into his ED in Lithuania – the use of audio and visual recording to analyse processes and to drive improvement. For a country without a long history of established EM, he had some refreshing and exciting ideas about quality improvement and I am really keen to hear what happens next. Simon, Heike and Willem facilitated a panel discussion around research priorities. We were split into African and non-African, prehospital and in-hospital teams (four in total) and we discussed our own research ideas using the expanding group to share and combine ideas. Finally, the most popular research ideas were offered to our expert panel, who explored their relevance to the African context and the realistic chance of the idea working as a research project. It was encouraging to find once again that our services face many of the same challenges, such as end-of-life-care and triaging systems. There’s no doubt in my mind that some of the solutions we find can have cross-relevance: but certainly not all. The focus in this session was really around African solutions to African problems (#AS2AP); the emphasis being that we cannot simply transplant something that works for us in one healthcare setting directly into another. The session wrapped up with Tim Hardcastle consolidating the discussion by outlining the route to publication. Afternoon workshops covered prehospital ultrasound, sports medicine, aggression and anger management and technology in medicine. The final session of talks covered some core Emergency Medicine topics, but ones which might not get the airtime they deserve at other conferences. Tammie Bailey-Stanton talked about end-of-life care in the ED, challenging us as an audience to consider how we would prefer to die; collectively we seemed to agree that final disease trajectory and function matters to us and we were left to ponder how often we compromise function in the name of “doing something” medical. Tammie shared a familiar case: the unexpected actively dying young patient, using the story to explore the difference between withdrawing and withholding treatments, concepts which hold equal weight in South African law but might have profoundly different effects on the way the patient dies. Her big recommendation was the 2017 paper by David Wang (@EMpallcare), available as #FOAMed here, which includes a 5 minute consultation around end-of-life care summarised in Table 3 in the paper. We’ve spoken about the needs of the palliative care patient too (both talking about dying, in the context of the actively dying patient, and symptom control in the context of the patient with terminal illness). Katrin Hruska spoke next, challenging us to rethink the impact of something we do (or should do) every day – handwashing. We know that hospital acquired infections have significant mortality and morbidity impact and this is true in Africa too as this open access paper from Ethiopia shows: length of stay increased from 8 to 14 days and mortality doubled. Katrin challenged us to think of handwashing to C Difficile as seatbelts to MVCs – a life-saving decision we can make but which seems to require a culture change. Perhaps the most interesting paper she presented was a Canadian study looking at the impact of the distance to the sink on handwashing rates when healthcare practitioners looked after patients known to have C Difficile; in the group who washed their hands, the average distance to a sink was 8m versus 13m in the group who didn’t wash their hands (and there were more non-handwashers than you might expect – check out this open access paper to find out more). Katrin’s tongue-in-cheek definition of a healthcare hero presents a real challenge to us: do we think of handwashing as a core clinical skill? Do we celebrate handwashing success and talk about it? Do we assess it in our simulation teaching and trauma team debrief as we do other clinical skills? Do we respectfully challenge our colleagues if we see them perform an intervention without appropriate hand hygiene first? Do we ask our colleagues to hold us accountable for our handwashing practices? I admit that for me the answer to most of these questions is no – so that’s something I definitely intend to change. Kirsten Kingma shared her story of injury in a foreign country, reminding us how vulnerable we can allow our patients to feel and how simple touch, time, kindness (and laxatives for opiate related constipation – described by the never to be forgotton phrase ‘when I finally delivered’…..) can make a world of difference. Her storytelling was compelling and thoughtful and an excellent reminder that we can improve experience significantly in very simple ways. Kirsten talked about the relationship between body and mind describing two terrifying and really distressing experiences. One where her postive mindset allowed her to recover from a paragliding accident resulting in major trauma and then later where her active lifestyle and positive approach to wellness allowed her to recover from some horrific events back home in South Africa. This was a really moving presentation that combined two incredible stories, humour and sadness but with a clear message that all of us stand on pedestals of support. Our families, our friends, our attitude to life and how we look after ourselves all act as support mechanisms. The day will come when one of those support mechanisms gets knowcked out from underneath you and it is at that time when you will rely on the others. Kirsten talked of how she used those remaining pillars to get through her pain to where she is now. She had a special word of thanks to the rest of the #badEM team who clearly did so much to support her to the stage at the conference. It was a brilliant talk. I've also been a patient fairly recently (&the mum of one..) & it definitely made me think about how I am with patients. Those little acts of kindness mean everything when you feel vulnerable & scared. Meaning – helping the patient to rewire the meaning of the pain they are experiencing. I didn’t get these quite right. But tried to add meaning, explain, and help context and follow up.